Starting in 2018 the NCISAA will move to four classifications. In recent years they have competed as three separate classifications in cross-country. This October at Jackson Park in Henderson, North Carolina they'll crown 8 individual and team champions. In the past 1A scored 3 in XC while 2A and 3A scored 5. I'd assume 1A will continue to score 3 athletes while 3A and 4A will certainly score 5. The debate will likely be on how many athletes to score for 2A at the coaches meeting next week. Below we posted the new returning XC rankings. We scored 4 returners for 2A for now since we aren't sure what it'll actually be this fall. This will also shake up the landscape of the NCISAA on the track. Currently, the NCISAA plans to hold a joint NCISAA 1A/2A State Championship for Outdoors and run the 3A & 4A State Championships at the same location, but score it as two separate meets. 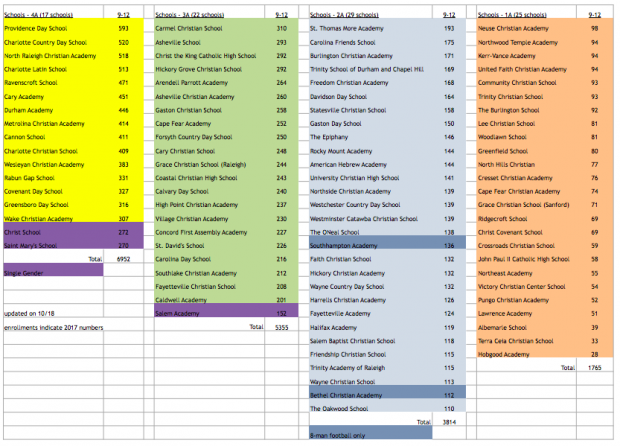 Below are the virtual meets for NCISAA 1A/2A, 3A & 4A for the spring of 2019.